For less than 300 calories, we love this recipe to feed the fam and keep them full. The estimated total time to make this recipe is 4-6 Hours. 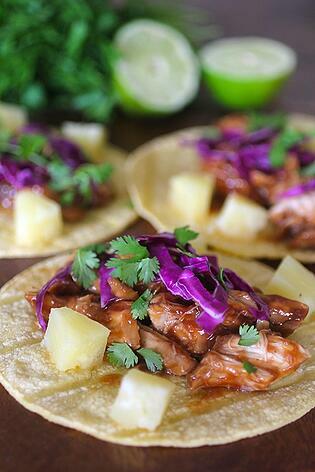 Pour juice from canned pineapple into the crockpot, (save the pineapple for later in the fridge). Add chicken and everything else to the crockpot, (except for the cornstarch/arrowroot powder). Cover and cook for 8 hours on low, or 4 hours on high. After cooking, remove the chicken with a slotted spoon and place in a small bowl. Shred chicken with two forks. Meanwhile, add the cornstarch mixture to the sauce in the crockpot, and stir to combine. Turn heat up to high, and add chicken back to crockpot, followed by the pineapple. Let sauce thicken for about 5 minutes, and stir just before serving. Serve over tortillas or a bed of lettuce if desired with additional toppings if desired. Enjoy!